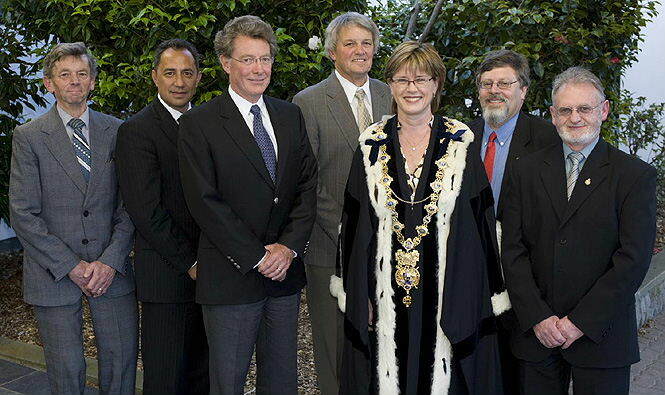 The Tawa Community Board elected in October 2007 comprised (from left in photo below) David Darroch, Dennis Sharman, Robert Tredger (chair), Graeme Sutton, Chris Reading and Graeme Hansen. The Mayor of Wellington, Kerry Prendergast, is also featured. Not in the photo, but part of the Community Board, are Northern Ward Councillors Ngaire Best and Hayley Wain. In 2006 the Tawa Community Board defended itself against Wellington City Councillors' attempts to abolish it. After the people of Tawa rallied to support the Board, a majority of Councillors agreed that the Board should be retained. Some months later, on 10 April 2007, the saga was concluded with the Local Government Commission ratifying the City Council's decision. At the time a number of articles appeared on this website detailing the state of the play. Those reports can be seen below. 14th August 2006 - WILL TAWA LOSE OUT YET AGAIN? 18th September 2006 - MAKING PROGRESS (OR ARE WE)?